STAR TREK BEYOND REVIEW: BREATHLESS ACTION, FUN TRIP! Director Justin Lin injects his Fast and Furious vigour to the series, says Sukanya Verma. If to live long and prosper is a promise the Star Trek brand made to its massive fan following, it’s keeping its end of the bargain. Celebrating its 50th anniversary this year, the franchise juggernaut comprising of small screen voyages and big continues to evoke nostalgia and inspire ingenuity. But it’s the combination of these two qualities in the third installment of the reboot series -- Star Trek Beyond -- what makes it worth a trip. My biggest takeaway (and relief) from the first one, which came out in 2009, is a Spock I could live with, even like. Zachary Quinto turns out to be just the Vulcan for the part. And even though Chris Pine is a bit of a scramble as Captain James T Kirk, one eventually warms up to him. The sequel (2013’s Star Trek Into Darkness) overplayed the bromance between its heroes, but it redeems itself in towering Benedict Cumberbatch’s treacherous villain. In its latest incarnation, dedicated to the recently departed members of the Star Trek family – Leonard Nimoy, the original, iconic Spock and a young, talented Anton Yelchin -- the narrative unburdens itself from backstories and relationship goals to plunge headlong into breathless action. It thus benefits from the curious interaction between the crew’s unlikely pairs in the face of survival. Producer J J Abrams vacates the director’s chair for Justin Lin to take over and inject his Fast and Furious vigour to the series. As a bonafide Trekkie, he proves worthy of the challenge. Beyond the scale and science, he recognises exploration and diversity as the very soul of Star Trek. Lin ambitiously juggles both in a plot, written by Doug Jung and Simon Pegg, driven by events that cater to big studio indispensables yet reasonably satisfy the fan. Daddy issues occupy somewhat lesser space of Captain Kirk’s mind -- they’re probably saving it up for the recently announced fourth film starring Chris Hemsworth as his father -- as he contemplates desk job to beat all the flying fatigue. The tedium of his mind is reiterated in a humorous montage of life on the Enterprise. Meanwhile, Spock is also having second thoughts about staying aboard even as Lieutenant Sulu misses his kid and husband. Never a subject of speculation, his homosexuality is just another sublime scene in the scheme of things but conveys the embracing spirit of Star Trek. Before they can mull or mingle any further, a degenerating alien called Krall -- armed with Idris Elba’s imposing baritone and multitude of drones -- comes down on the Starfleet star ship in a dramatic sequence, that’s even more awe-inspiring in 3D. Stranded and strewn in different corners of a hostile alien planet, it’s the play of combinations alternating around the spectacle that adds to the fun. 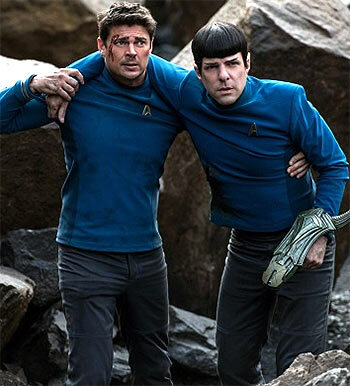 Between a bantering Spock-McCoy (Karl Urban is a scream) equation, adventurous tone of Kirk-Chekov’s (Yelchin, hard to believe he’s gone) escapades, Krall hostages Sulu-Uhura (Zoe Saldana)’s worrisome realisations and nerd speaking Scotty (Pegg goes overboard doing the ‘Lassie’ bit)-Jaylah’s (Sofia Boutella, who happens to be a local tech-savvy hunter and the film’s most pronounced all-rounder and coolest new addition) grand pursuit, Star Trek appears to resist any urge to join the club of mindless blockbuster monsters for a good part of its duration. Too bad that the lengthy, noisy, excessive climax and a bizarre explanation for Krall’s bad behaviour hurls Star Trek Beyond, right into their midst. Still, as the saying goes, well begun is half done.